A three week course combining interactive spaces, prototyping, and mixed reality. SpacePainter was created by Ubaldo Andrea Desiato, Federico Peliti, and Mantas Lilis. 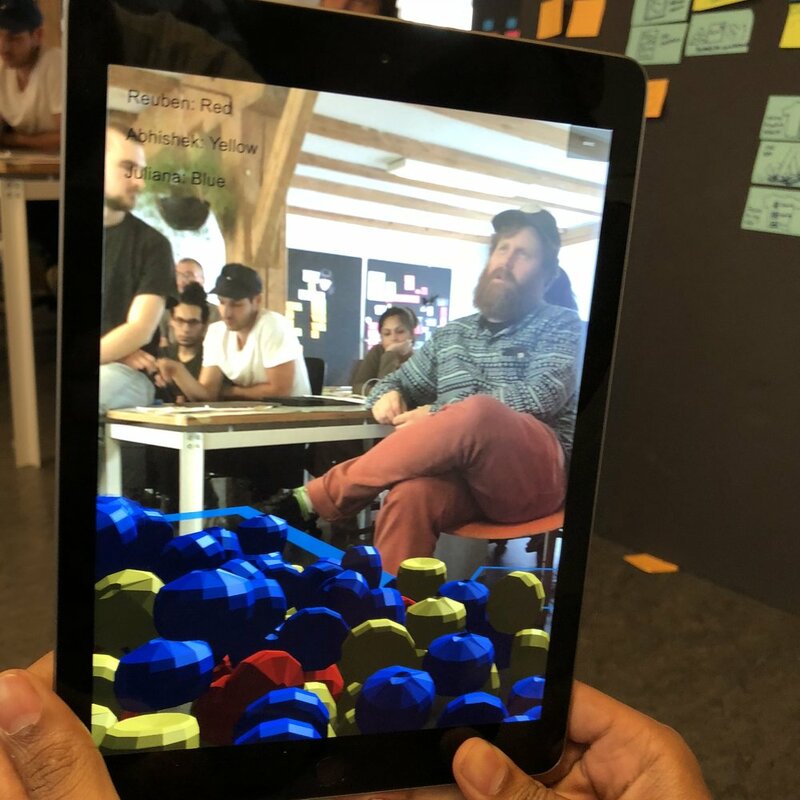 Read more about this group building a shared AR experience in a 5-day design sprint Project. An exploration by Alex Penman, Julius Ingeman Breitenstein and Rina Shumylo. Read more about the Haptification Manifesto on medium. Follow the journey of Sareena Avadhany, Shalin Shah, and Varenya Raj exploring and working with XR technologies. Read more about Reuben DSilva, Juliana Lewis and Raunaq Patel's approach to giving data volume in your world. Learn more about the concept and process for Unencumbered Reality by Anna Smeragliuolo, Axel Jorgensen, and Surojit Dey, and Yuxi Liu. Abhishek Kumar, Fahmida Azad and Raphael Katz wrote up more thinking about Designing Augmented Apparel. Augmented Storybook was created by Chaeri Bong and Sindhumandari. Over the last decade brainstorming has come under fire as a methodology for some good reasons. It can produce less ideas with less variation. Read this Harvard Business Review article which sites some of the research for more information about the controversy. Many of us have experienced a brainstorm that fell flat, here are some guidelines we use to frame more effective brainstorming. Don't be afraid to get weird, take tangents, and express the ideas you are worried will make you look foolish or unknowledgable. Start with the agreement that the goal of the Brainstorm is to map the terrain of the idea together. One of the strengths of a group brainstorm can be building on each others ideas to find new areas to explore. Everyone should play a role in facilitating and advocating for others in the group. How might we create world peace? It's a great question, but I suspect your brainstorm will be ambling and unlikely to produce many ideas that are solid enough to build on. The terrain is so vast that it's unlikely you will cover it in any meaningful detail. How could we improve the brainstorm? Constraints. How might we increase peace with a daily ritual? How might we triple peace with a evening ritual using Android phones in Chicago with a cubist artistic approach? You can probably come up with some ideas, but you will get diminishing results quickly. The problem is that there are a lot of constraints to keep in mind at the same time and the area of coverage has become too constrained. This is sometimes referred to as 'overfittting' the problem space because the ideas are too close to one or a few specific solutions. So before brainstorming come up with some different 'How might we' style questions to ask the group. If you are having trouble forming the questions, this might help to create a variety. How might we use the ____ to ____ with _____ ? How might we create ____with___to____ ? How might we showcase ____ with ____ in order to _____ ? 8. It’s about ideas generation, not idea evaluation. This presentation covers the thoughts behind the course, our history in this area, and thoughts about UX for the future, when we are unable to distinguish the physical and digital. We use Spacebrew.cc to help construct interactive spaces for the course. At the beginning of day 2 we reviewed Makey Makey prototypes from the previous day and then setup our computer environments for prototyping with the tools of the YUXI: The Mixed Reality Hardware Toolkit. It started with installing drivers and using the Serial Console cable to connect to the Raspberry Pi. We learned that installing both drivers is a better methodology for getting started. You can use raspi-config to change the wifi settings and enable SSH. Once enabled you can login to the device via ssh like this.. The address should be the address that your pi has received from the wifi router. You can use ifconfig to determine the address of your pi on the network. Once connected we began to run through 3 demo projects. Brief: We are in a rare situation at the very beginning of a platform shift. This time gives artists, designers, and technologists a unique opportunity to shape the medium. The growth of MR/AR/VR is being invested in heavily by the major technology companies of the world. Small thoughtful projects at this moment have a chance to sway the industry and the public imagination towards more preferable futures. In groups of 2-3 create a project using the Mixed Reality Hardware Toolkit that captures a finely tuned micro-interaction between the physical and virtual. Use sensors and actuators that blur our imagination of what is real in the interaction. The goal is to play with the space between the physical and virtual and create something that other people might recreate. Each group will also create a tutorial that we will publish on Github under an MIT Open Source license. We covered the basics of the Unity Editor and distributed hardware sensors and actuators to each of the groups. We began the day by walking through more of the steps to editing and understanding Python. You can use Learn Python to discover more about the Language. We then transitioned to learning how to code object behaviors in Unity using C# and shared a collection of resources for learning more. We will assemble documents, prototypes, roadmaps, frameworks, ethical guidelines, and inspiration for this emerging set of technologies. We will use these materials to engage in a global discourse on these emerging technologies. The end of the day was dedicated to the process of Discovery & Immersion to establish a terrain to explore during the concept phase. On Tuesday groups framed a set of 'How might we' style question which were created from the terrain defined by their Discovery process. On Wednesday they developed a plan to develop the design of their project which they worked on until Friday, when we gathered to do Alpha testing of our projects. Students left on Friday with written feedback from each group on their project with the goal of being able to prioritize the last tweaks and features to add or remove from their experience. To begin week 3 we invited visitors to come and test a Beta version of the project developed from the previous week. Tuesday was dedicated to design production of final elements and students began to document their projects through video and writing (see beginning of this article). On Friday we began to share out the projects and refine our documentation. Our concept for the course was to take our group of students with us as we explored an emerging medium with new technologies, tools, and methods. In particular we wanted to create projects which reached between the physical and digital realms and blended them into holistic experiences. We were both excited and terrified to try something so ambiguous and ambitious in the course, but it was an incredible experience that taught us many lessons about the future. Thank you to all of the people of CIID who helped make this course possible as well as the students of the IDP 2018 who trusted us as their tour guides.